In case you haven’t figured out yet how to download Kindle for iPhone even though it was only available at the U.S. iTunes Store, well don’t bother doing the trick anymore. Kindle for iPhone is now available internationally. Meaning, no matter where you are, for as long as you are covered by the 60 countries as mentioned bv the official announcement, you can now download the free app on your iPhone or iPod Touch. Kindle for iPhone features Amazon’s Whispersync which allows you to save and synchronize your bookmarks across all your Kindle devices – Kindle ereader, Kindle for PC or Kindle for iPhone and iPod Touch. I’m telling you, this is one reason alone to download this app. The synchonization features is definitely one of the high end of this iPhone app. Of course, Amazon is promoting this iPhone app as a companion to its Kindle and Kindle DX ereaders. But many who don’t own the Kindle yet can do away with it and use Kindle for iPhone as a primary ebook reader. Purchase, download and read hundreds of thousands of books available in the Kindle Store. Read the beginning of books for free before they buy. Add and automatically synchronize bookmarks and last page read. 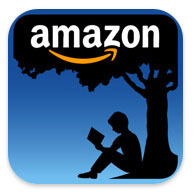 Access their library of previously purchased Kindle books stored on Amazon’s servers for free. Choose from six different font sizes and adjust words per line. Add and view notes and highlights marked on Kindle and Kindle DX. Read books in full color including children’s books, cookbooks, travel books, textbooks and graphic novels. Ok now Amazon, please give us Kindle for Mac, next. Ready to download the app? Here’s the iTunes Link.